Pav Bhaji Masala is a popular street food of Mumbai. 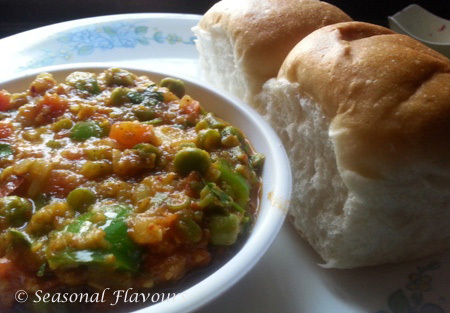 Mumbai Pav Bhaji Street Style is a spicy mix of veggies served with buttery pavs. Full of flavours, Pav Bhaji Masala recipe is a simple and filling dish, easy to cook. Buttered pavs or buns with spiced mixed vegetable bhaji or curry is a quick and easy snack straight from the bustling streets of Mumbai. Relish piping hot dinner rolls or pavs served with a spicy mish-mash of vegetables, Mumbai style. Pav Bhaji Masala – a spiced vegetables mix, cooked with fresh tomatoes and consumed with pan-fried buttery bread. Pav is a small bun and the Bhaji is mixed vegetables dish. Indian Pav Bhaji Chaat is a popular vegetarian street food and an all time family-favorite. 1. For this easy Pav Bhaji vegetarian recipe, wash and cut cauliflower, potatoes, beans, carrots, tomatoes, capsicum and onions into small pieces. Chop the coriander leaves. Make a paste of ginger, garlic and chillies. 2. Heat water in a deep pan and boil beans, cauliflower, potatoes, peas, and carrots till cooked. Strain out the vegetables and mash them lightly. 3. Heat about 2 tbsp oil in a kadai and drop in the chopped onions. Fry till the onions turn pink. Add the ground ginger-garlic-chilli paste and sauté for a couple of minutes. 4. Add the tomatoes, mix well and cook till they turn pulpy. Put in the chopped capsicums and stir for a minute. 5. Add the boiled veggies and combine well. Simmer on low heat for a couple of minutes. Lightly press the veggies with the back of a spoon. 6. Add the spice powders – turmeric, black salt, red chilli powder, pav bhaji masala powder and salt. Pour a cup of water, mix well and simmer for 4-5 minutes. 7. Sprinkle some lemon juice and coriander leaves and remove the bhajee masala. 8. Cut the Pavs into two. Apply butter and lightly toast the Pavs on a pan. 9. Enjoy delicious Pav Bhaji Masala Mumbai style. If you are looking for more Indian street food recipes, do try out Aloo Chana Chaat and Ghugni Chaat. Pav Bhaji Mumbai style is a colorful and flavourful Mumbai street food. Learn how to make Pav Bhaji with this easy recipe. Peel and cube the potatoes. Finely chop the cauliflower, beans, tomatoes, capsicum, carrots, onions and coriander leaves. Boil potatoes, beans, cauliflower, peas,and carrots till tender. Drain the water and lightly mash the vegetables with the back of a spoon. Grind ginger, garlic and green chillies. Heat oil in a pan. Add chopped onions and sauté till they turn a light brown. Add the ginger-garlic-chilli paste and fry for 1-2 minutes. Tip in the chopped tomatoes, stir well and cook covered for 2-3 minutes till they turn soft and oil starts leaving the sides. Add the chopped capsicums and sauté for 1 minute. Add the boiled and lightly mashed vegetables to the tomato mixture. Combine well and let it simmer for 2-3 minutes. Press with back of a spoon to mash vegetables. Add turmeric powder, chilli powder, black salt, pav bhaji masala and salt and mix well. Add a cup of water and cook for 4-5 minutes till all the masalas are well blended. Remove and sprinkle lemon juice and garnish with fresh coriander leaves. Slice the pavs into 2 horizontally. Apply butter to each side and pan fry the pavs until golden brown. Serve toasted Pavs with hot Bhaji topped with chopped onions and coriander.